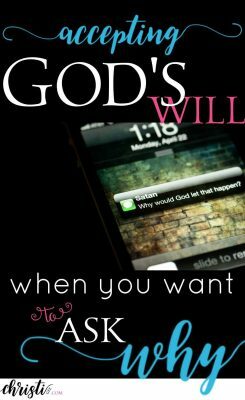 Blog Feed 2 powerful questions for accepting God's will when you want to ask "Why"
It’s one word. Three letters. In word economics, it should be cheap. You could fill a tweet with it more than 40 times. It’s so small. Seemingly insignificant. But when you let it invade your thoughts, infect your heart, and cross your lips, it sets up camp and charges rent. And the price is exorbitant. What is that one word? Why. No, this isn’t an Abbot and Costello routine. I’m not asking you why you want to know the word; I’m telling you the word is W.H.Y. This word rarely comes up when life is behaving according to our script. It’s during those times when the background is crashing around us, the actors aren’t delivering their lines as planned, and our role as director and producer of our lives is being challenged that this prima donna of a word enters stage right onto the scene. Drama queen. Headed straight for center stage. And once it is planted there, all other action stops. No one moves forward or moves on. You might as well find a chair and have a seat because you’re going to be there a while. I admit that’s a lot of personification to make a point. Once we start pondering the “why” of our own dramas, all other healthy thoughts and forward motion are held hostage. We see this in the record of the Israelites’ behavior after leaving Egypt. They quickly resorted to grumbling, looking back at Egypt with a collective selective memory. Over and over their use of the word “why” is documented. And it’s never a pretty picture. They definitey had trouble accepting God’s will. It goes on and on, but I think you get the point. We all can self-identify to some extent with the people of Israel if we’re honest. We spend much of our lives looking back at what “could have been”— and often with rose-colored glasses. An equally large portion is spent wishing for an easier route to the Promised Land. Asking “why” quickly morphs into whine in either scenario and Solomon cautions that this is never wise. And as the why ferments into whine, we find ourselves stalled. We can’t simultaneously move forward while we stand still asking, “Why did this happen,” pause to look back longingly for the days before it did, or go on strike until we are assured of a better future. Whenever I teach about recognizing the enemy’s lies and resisting them, I end with explaining that it’s not enough to simply recognize and remove. We have to replace lies with specific truth. The same is true with eliminating “why” as our own default response when trouble and trials arise. 1. How do I make this count and cooperate with God’s work in my life? You’ve likely heard it stated many times that God is more interested in character forming than circumstance shaping. But when we submit to the difficult circumstances, our character actually comes out both shaped and reformed. Trials refine so that you reflect your Savior more visibly, just like silver reflects more clearly after it has been melted and hammered and buffed. and embracing the work of the master’s hands. and running from the silversmith’s shop. In God’s economy, nothing is wasted. 2. Who can I comfort because of what I’ve experienced? When those who have “been there” look around, they see the struggle of others more quickly. You know when to sit beside and say, “I’m sorry,” and how deeply that counts. And you know when to stand and cheer, “It’s time to move,” and how much that helps. God intends for you to use your experience of weakness — where you learned that His grace was sufficient and His power was your strength — for good. The noose that once threatened to take your last breath transforms into a lifeline for someone else. Your scars become calling cards that open doors to speak truth to others who recognize them as credentials. And as you limp, you will lead others toward the light — many who never would have followed if you were sprinting ahead of them. When you comfort, encourage, and proclaim, “There is a way forward after fear, failure, and famine,” you participate in redeeming your pain. ‘Why do you cry to me? Did you notice that the same word used by the group to grumble is the word their God used to give marching orders? I had never made the connection until I began studying for this post. I was floored at the synergy and the irony. Yes, going forward is the goal. Yes, we must give up our perceived right to ask, “Why” in accepting God’s will. But whoa. Be prepared that as part of the forward progress, we may first be faced with God asking the questions. 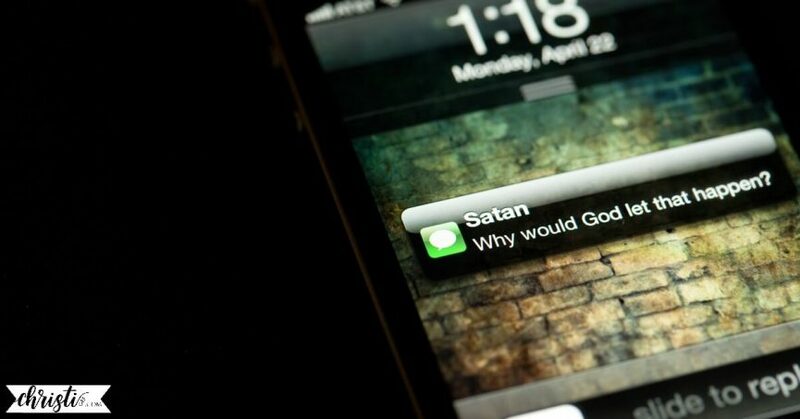 Over and over throughout both testaments, the Lord asks this question. It’s never because He doesn’t know the answer. But it always reveals something the questionees need to remove or refine in their lives. These selected verses only scratch the surface. This word appears to have been one of Jesus’ favorites. He wasted no time in getting to the root of the problem and exposing the toxic thoughts that were thwarting forward progress. Like I said in the beginning. Seemingly so small and insignificant but, in reality, a double-edged sword. May God grant us the wisdom to replace it in our own questions and the discernment to let it do its full work of revealing when He is the one asking. 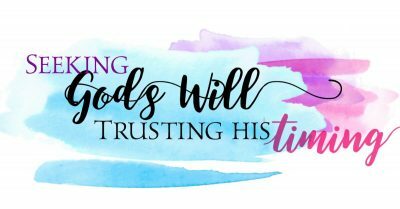 biblically-based guidance for you in accepting God’s will and trusting His timing. Thank you, Christi. Those are great questions to replace a few of the whines in my life right now. I appreciate your Godly direction. You are such a treasure and I am so blessed to know you. Thank you for this affirmation. Humbled by your comment. Sorry, but I disagree with some of the core ideas in this post. God tells us to “come reason together.” There is a big difference between asking God a question without faith and asking one with faith. For example, it is understandable when a couple loses their newborn baby and asks God, “Why did this happen, God? I can’t understand it!” when the heart of the person is not turning from God and faith in Him in the asking. It is part of grief to grapple with the question of Why. I have seen a lot of Christians who have not undergone tragedy who have this very simplistic mindset toward the question of Why. However, you are not understanding the dilemma of the adult who now must grapple with the consequences of someone else’s sins in their lives, as a survivor of childhood sexual or physical abuse must. Sooner or later, that person will run straight into the realization that our God is the God of the whole universe who set the cosmos in place and has the ultimate power and authority to change anything He wants about the world. That means God has the power to have stopped what was happening through any number of interventions, or to stop it from beginning, or even to prevent the birth that landed a child in such a devastating situation. I have grappled with the question of Why in my own life. I have come to God asking Him why the things in my life that have tripped me up for so long happened. Why He allowed my dad to beat me. Why He put me in a family where my alcoholic mother wouldn’t protect me. Why I was raped. I came to Him openly with raw and gaping wounds because of what was done to me. Do you know what He finally asked me in return? God, in His infinite wisdom, never condemned me for asking Why. It is natural to ask. Instead, He asked me to trust that He has a plan and a purpose for my life that was set before the foundations of the world. He asked me to trust Him, even when life doesn’t make sense. Corrie Ten Boom, the survivor of the nazi concentration camps who went on to write books (including The Hiding Place) and bring healing words to millions, famously said, “Faith is trusting in God’s character when life has given you a reason not to.” She understood pain, hardship, and suffering. Sometimes life gives us good reasons to ask, “Why, God, why did You, You who rule and reign over all creation and notice even the sparrow’s death, why did You allow this?” And God, from my experience, doesn’t provide a quick and easy answer. Instead, He asks for our faith. He asks us to believe that He is still good, even when life is hard. I am so sorry for your pain. It sounds like God has met you where you needed and for that I praise Him with you. He never fails. Thank you for taking the time to add such thoughtful discussion. Yes, God is good. All the time. Excellent post, yet again, Christi! I love the courageous truthfulness and challenge toward godliness. I’m thoroughly enjoying your blog! Thank you so much for that precious encouragement! I have enjoyed my time over at your place ;) as well.